We had an amazing ceremony to celebrate Virginia's 91 years on the earth. With songs and stories, we sent her off with the Angels. 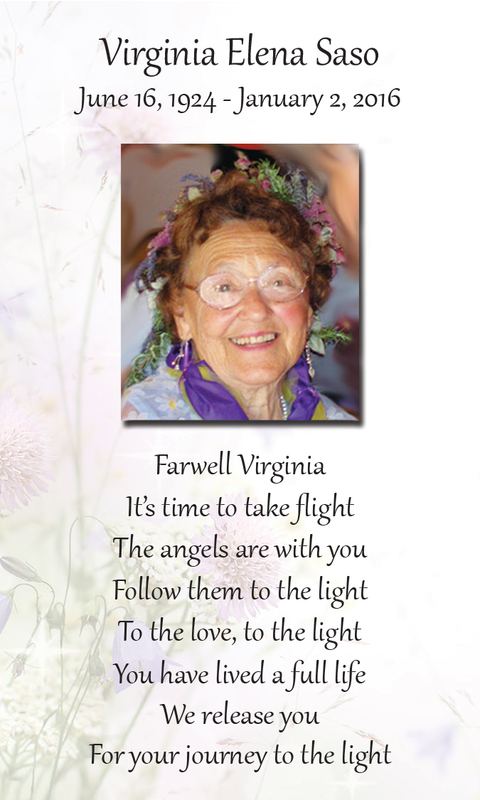 Click here to read the poem Emma wrote for Grandma Virginia. My name is Chris Saso and I am Virginia's youngest child. I am the baby and she never let me forget that. Virginia was 41 years old when she had me. I am the youngest of 8 kids, I am from a big family, but also I am from a small family. I am just shy of 6 years younger than my brother Tom --whooopppsss, so by the time I was 12 the last sibling had moved out of the house in Saratoga and I was really an only child. My mom was my best friend. I was an only child for 6 years with Louie and Virginia through middle school and high school where I got to spend quality time working in the garden and stemming dried flowers during the day and watching TV with Virginia and Louie at night. Virginia looked out for me... she told me from as early as I can remember that I was going away to college. When it came time to go away to college mom made sure I went far away so Louie wouldn't have me out in the garden watering and weeding. She knew I had to get away to grow up. We called her Virginia and Mom and my kids called her Nana. Virginia kept up on what was going on in the world by listening to KGO news radio when she was cooking in the kitchen, working in the yard (She carried a portable radio around and a portable phone) or working in her shed making beautiful flower arrangements. Virginia was always looking out for ways to improve her crafts. Her "shed" as we called it, was full of amazing potpourri smells, amazing wreaths and during the winter time full of Christmas crafts and ornaments. She went to craft shows to learn new things and she came back with a huge smile on her face when she was working on a new idea for a wreath or table arrangement, etc. She held her own Herbal Harvest Fair every year which was a weekend extravaganza with many artists selling their arts and crafts under the amazing oak tree. She loved teaching and working side by side with Betty Rimbach and Mary Lou and the many apprentices that touched down at the Saso Herb Gardens for sometimes as short as weeks and for some as long as years. It was mom that kept the business humming. She spent many nights after dinner and before we watched Love Boat and Fantasy Island, working in the office on all of the financials. She invested their savings in the stock market, in CD's, in Money Market accounts, in real estate and she taught me about finances and investing. She was a great teacher and I learned a ton from her. She taught me that Hate is truly a four letter word and people should never hate other people. Mom truly loved to have all of her children under her roof at Christmas time. Weeks before Christmas we would spend hours decorating the xmas tree. Louie and I would put on the lights and then mom and I would get the stools out and start decorating the xmas tree and we would talk about the story behind each ornament, identifying our favorites along the way. The Saso clan put on huge xmas eve celebrations, complete with visits from Santa. Mom was the mastermind behind it all - buzzing around the house helping all of the kids decorate banana boxes for our gifts with white butcher paper that we wrote on and decorated with xmas designs. While sipping her glass of Almaden Chablis poured from a 1/2 gallon jug that fit nicely in the fridge door... She made Lasagna, Ravioli and always served warm garlic bread, great salads and fresh vegetables! Herbs were spread over everything of course. My favorite dish that she made on my birthday was chicken crepes with cream sauce. She bought a special crepe making pan that we used together every year to make my birthday crepes. By the way - we will have a gallon of Chablis at the reception if you want to share a glass with us. My mom new how to manage people, she managed my dad, she managed 8 kids and she managed me. When she took me to the Dentist, she talked more about the hot fudge Sundae we were going to have afterward then she did about the fact that the dentist was going to be drilling my teeth that afternoon. She loved sweets and she loved chocolate - I inherited that trait from her for sure. Mom made the holidays special. For Easter we had this tradition: the night before Easter mom and I would sit in the kitchen and cut up carrots in small circles. We would take the carrot pieces and lay them out in a trail from the front door of the house across the living room floor, up the stairs and through the hallway to the door of my room. In the morning, all of the carrots were gone - I am sure I would have found them in the compost pile if I ever thought to go look -in their place outside my door was a big Easter basket full of chocolates and hard boiled eggs and marshmallow peeps. Sorry Logan and Noah - that is one tradition I did not keep going in our Jewish household. Maybe we'll have to bring that one back just once before Logan goes off to college this fall. Of course mom was an excellent cook. I have mentioned this already, but I wanted to mention a few other examples of snacks that we would enjoy together. She taught me how to make popcorn on the stove. In a big pot she would put in a layer of oil and a few kernels of popcorn, when those popped she would add in a layer of popcorn kernels and after a minute or so of vigorous shaking the pot would be full of popcorn. Mom also kept organic tortilla chips under the counter, invariably by the time we wanted to eat them they were very stale. Her trick was to turn them into nachos and warm them in the oven with a layer of cheddar cheese on top. Of course the cheddar cheese was not ORANGE, it was a natural organic white color. Over the past few weeks as I went through boxes of old family photos I realized that I got my love of photography from Papa Louie, but I got my urge to be a pack rat from Virginia. In the boxes I found images from 1829 of either her great grandparents or my dads - I don't know which yet. I found Bob's birth announcement from 73 years ago, which I am placing in the URN for mom. I found pictures from the late 1800's and early 1900's that show the hard working life our ancestors led and the hard working life she had as a child growing up on a farm in Sunnyvale growing apricots and prunes. Virginia raised and nurtured 8 children, 18 grand children and 14 great-grandchildren and as my wife Sue put it - SHE WAS SMALL BUT MIGHTY, had an OPEN HEART and was LOVED BY MANY. What I want to talk about is the last segment of mom’s life. At the end of 2007, I moved some things to her house so I could go traveling and I took my first trip to Peru in the beginning of 2008. When I returned I began to notice that she was having trouble remembering things like the names of flowers. That wasn’t so surprising but as time went on, she could keep track of less and less. Mom cooked 3 meals a day for Louie for 63 years. And all of those dinners to all of us kids. I watched her "quit her job." She didn’t want to cook anymore and was happy with anything I could conjure up. We ate a lot of steamed veggies. I also witnessed her giving up on numbers and paying bills, things were getting too confusing. She spent a lot of time in her chair reading novels and could watch NCIS for hours. To me, it felt like her family. After the first couple trips to Peru, I had to find someone to stay with her while I was gone as she needed watching over and meals prepared. Eventually she needed full time care and more than I could give her so Mary and Glaine moved in to take care of her. In the almost 4 years that they lived with and took care of mom, I would spend time with her so they could get a bit of time away. Then the time came for her to go to Montecito Mannor closely following the departure of her sister Daisy who lived there up until a few months before mom. It was just like in school where younger siblings were automatically welcomed into the group. They loved Daisy so they loved mom. Plus, Virginia smiled a lot and was always in a good mood. The caregiveres often commented on that. And she had the rosiest cheeks in the joint. Almost every month I visited her at Montecito mannor guitar in hand. I reached in and let her know I was there and I always felt like we connected until the last 2 months when she receded so much. I treasure the relationship I had with mom until the very end. Jody was the last one in the family to see her the day before she passed. She sent me videos of her singing along with my CD while stroking “Great” as they call her. And then, in a throughly modern mannor, Jody face-timed me and I got to face-time with mom the day before she took off. The Song I wrote with mom when I lived with her from end of 2007 till the middle of 2010. Soaring up up so high, and then they glide. Here is an audio track of mom and I singing the song. I caught her shortly before she stopped speaking. What a treasure!